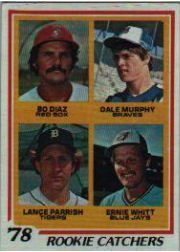 Once, the Detroit Tigers believed Lance Parrish belonged at the hot corner. The conversion wasn’t a huge shock, Parrish told in an insightful letter. Parrish’s transformation wasn’t immediate. He led the league in passed balls in 1979. However, by 1983, he began a three-year reign as the junior circuit’s Gold Glove receiver. Nevertheless, I was still proud of my career fielding average and my ability to throw out would-be base stealers. Also felt like I worked well with the pitchers I handled. Tomorrow: enjoy a letter from catcher Bob Didier, who reveals how he handled two superstar knuckleballers in his rookie season. I was a big fan of Lance Parrish while growing up in the '70s and '80s. What's he doing these days?